Nicklas Backstrom, Washington's top pick in the 2006 Draft, has fit in perfectly playing with all-star Alex Ovechkin, and figures to draw plently of consideration for this year's Calder trophy. Being Alex Ovechkin's center has some distinct advantages to be sure. You get a lot of face time celebrating goals with "AO", your ice time soars, as do your minutes on the power play. And if you're a rookie like Nicklas Backstrom, you rocket up the charts in terms of Calder trophy awareness. Now Backstrom was selected fourth overall in the 2006 Entry Draft, so he doesn't fit the bill as an unknown bursting on to the hockey scene in Washington. No, the Capitals have had high hopes for Backstrom. But perhaps just as importantly, Backstrom has more than justified the faith the team had in him with the first-round selection. NHL.com's Dan Rosen profiled Backstrom earlier this season, and the picture was about what you might have expected. Backstrom was not only adjusting to the NHL, but also to life in North America that is far different than Sweden. He often found solace at the home of teammate Michael Nylander, his wife Camilla and their six kids. "Coming to his house, it's like coming to paradise," Backstrom said. "The food. He's a very good cook." "When he comes I have to make a special dinner for him because he doesn't eat everything," Nylander cracked. "I have to cook two things. He'll eat pasta, meatballs and chicken. He won't eat fish, but he will learn in time, for sure. "Hockey is played the same way everywhere; once they get to the rink everybody knows what to do," Nylander told NHL.com at the time. "The big adjustment is off the ice, and leaving Sweden by himself. It's always easier if you have another Swedish guy who has been there and done that and knows what to do. If there are questions that need to be answered, maybe I can help him out." Nylander did more than his part to help the 19-year-old get acclimated. He may have done more in an unfortunate sense, as his season-ending injury opened the door for a larger role for Backstrom. Heading into weekend play, Backstrom now leads all NHL rookies in scoring with 11 goals and 47 assists, one point ahead of Chicago's Pat Kane. On the ice, there can be no bigger contrast that watching Backstrom and Ovechkin. As we all know "AO" is rock and roll, his game a loud, explosive series of hits, speed and goals. 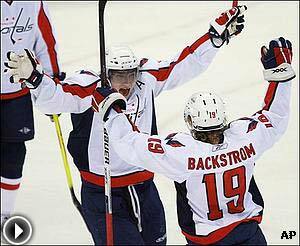 Backstrom is the laid-back passer, the playmaker who lets Ovechkin do his thing. It's been quite a show. All season, the Calder spotlight has been on Kane and teammate Jonathan Toews in Chicago where they have put together a remarkable season. But as Ovechkin's goal total has climbed, just as the Caps have climbed in the standings to challenge for a playoff berth, attention has now become focused on Backstrom. To no one's surprise, Backstrom is dismissive of Calder talk. "It's not something I think about it," Backstrom told The Washington Post. "I just want to go to the playoffs. That's my goal." OK, let's end this piece with something sexier, Alex? "He is the best rookie," Ovechkin said. "He makes unbelievable passes. In the future, he will be the best center in the League." Crosby likes deal -- Sidney Crosby said he is very happy with the trades that brought Marian Hossa, Pascal Dupuis and Hal Gill to Pittsburgh. "We gave ourselves a better lineup, and it's up to us to take advantage of it," Crosby said. "Just because we get a couple of guys doesn't mean everything will be roses. That's not how it works. You still have to work hard and come with a good attitude. You're still going to need your good breaks, but it definitely gives us a good chance to be successful." No quit -- Anyone who has been around Tampa Bay Lightning coach John Tortorella knows that his team's struggles this season have been a killer. They also know that Tortorella won't give up and will look for wins right until the last second of the season. "We're not here to just play it out. We're here to win," Tortorella told reporters. "I don't know how to act in this situation. It's a kick in the gut." new Director of Prospect Development. Burke's back -- Sean Burke is back in the NHL, having accepted the position as director of prospect development for the Phoenix Coyotes. Burke burst on to the NHL scene in 1988 with New Jersey, leading the upstart Devils to the Eastern Conference final in the first season New Jersey qualified for the postseason. 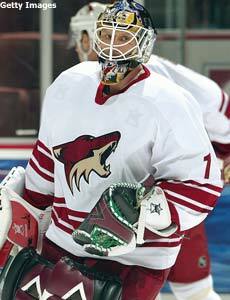 Burke played a total of 18 NHL seasons and he spent 1999-2004 with the Coyotes. In his new position, Burke will work with the club's prospects in the minor leagues and amateur ranks. "I am very excited to be back with the Coyotes organization," said Burke. "The five seasons I spent here as a player were the most enjoyable years of my career." Deciphering Jacques -- One of the refreshing things about Minnesota Wild coach Jacques Lemaire is he rarely gets into "spinning" things. There usually is good with the bad and bad with the good. Or other words, realism. Take this recent characterization of Brent Burns. "He's got a lot of energy. ... He loves to be on the ice," Lemaire said to a reporter's query on Burns. Lemaire was then asked if Burns is playing his best hockey. "Let's put it this way," Lemaire said. "He's exciting to watch." Ah, Jacques, is that good or bad? Been there, done that -- Brent Sutter spent 17 seasons as an NHL player with the Islanders and Blackhawks. He then became a very successful coach in the Western Hockey League and international ranks. Perhaps that combination is why he has stepped in so seamlessly with the New Jersey Devils as a head coach. "It has not been as big an adjustment as people think," Sutter said. "When you have played at this level, you understand what players feel and what they think in situations and you try to help them through it. Sometimes it is a big pat on the back, sometimes it is a kick on the behind. "If I was not enjoying it, I would not be standing here doing it, I can tell you that right now." Still a mystery to me -- You might think that Dany Heatley would have quite a bit of insight on what it takes to score goals since he is so proficient at it. Nope. He's as baffled by it as the rest of us. "Goal scoring is kind of mysterious," Heatley said. "They come and they go. I can't really explain it. "Sometimes it's little things. Maybe you're trying to do too much and not shooting the puck enough. At the end of the day, some days they go in, some days they don't." Thornton as salesman -- Defenseman Brian Campbell is staying with the San Jose Sharks! Well, at least according to the irrepressible Joe Thornton, whose good-natured ways are a strong selling point, not to mention his playmaking skills. Asked about Campbell's future the other day, Thornton was bullish on having the offensive defenseman around for the long haul. "He's already going to sign with the Sharks," Thornton said. "There's no question. You see the sunshine out there? Where else would he want to go play? "Whoever plays here just loves it and falls in love with the area. You're in shorts. I'm in shorts. Life is good out here." I may have to call a realtor. none of the trade rumors involving him came true. 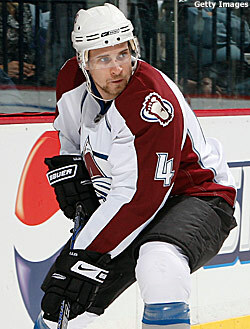 Happy to stay put -- Colorado Avalanche defenseman John-Michael Liles will be an unrestricted free agent this summer, so he also heard his name attached to a lot of trade rumors. With the deadline past, Liles told Jim Benton of The Rocky Mountain News he is happy to be staying put. "I was pretty relieved," Liles said. "It was a big weight off my shoulders, hopefully it will start the ball rolling and I can keep it going. "I was king of biting my nails for a bit that Tuesday. It was a little scary. I was sitting in the room with Scott Hannan and it was about a half-hour after the trade deadline. Ryan Smyth did the nicest thing and told me he didn't find out he had been traded until 40 minutes after the trade deadline. "I was sitting in my room at 35 minutes after the trade deadline and TSN comes on and says we have confirmation that 28 of 30 teams are done trading. The only two teams that we don't have confirmation on are Colorado and Philadelphia. The guy turns around and is going 'wait a minute we have another trade.' I'm just really happy I'm still here." Teach your children well -- Never take the chance to win a Stanley Cup for granted. That sage advice comes from Pittsburgh Penguins veteran Gary Roberts and should be taken to heart all across the NHL. "At age 23, I won the Stanley Cup in Calgary, and I thought; 'Boy, how many more of these am I going to win?'" Roberts said. "It is 19 years later and I haven't been back to the Cup Final. "You have a short window of opportunity to win the Stanley Cup, and we all know that window is the next couple of years. Hopefully, that is sooner for me." Another Crosby fan -- Not at all surprising that Sidney Crosby has legions of fans. But he met a fairly famous fan the other night in Tampa when New York Yankees outfielder Johnny Damon stopped by to meet Crosby after a game against the Lightning. "Who's not a fan of his?" Damon told reporters. "Me being from Orlando, I do have some loyalties to Tampa, but seeing that kid play is just amazing."